24 Hour emergency response can get you up and running any time, day or night. Diagnostic fee includes travel and troubleshooting. Guarantees you will know how much the repair will cost; no surprises. 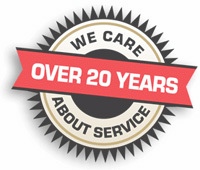 Dedicated Satisfaction ensures you are in contact with a professional who cares about your needs and expectations.